It is one of perhaps many “new normals” to follow. Would this be a case of less ice equals more fetch? Exactly. 985 mb storm is driving 14 foot waves and 40 mph winds in the offshore region. 25 to 35 mph winds and 11 foot waves in the near shore environment. It’s about equivalent to a typical nor-easter seen off the US East Coast. But the coastline at Barrow is not accustomed to such storms. So the impacts would be greater. 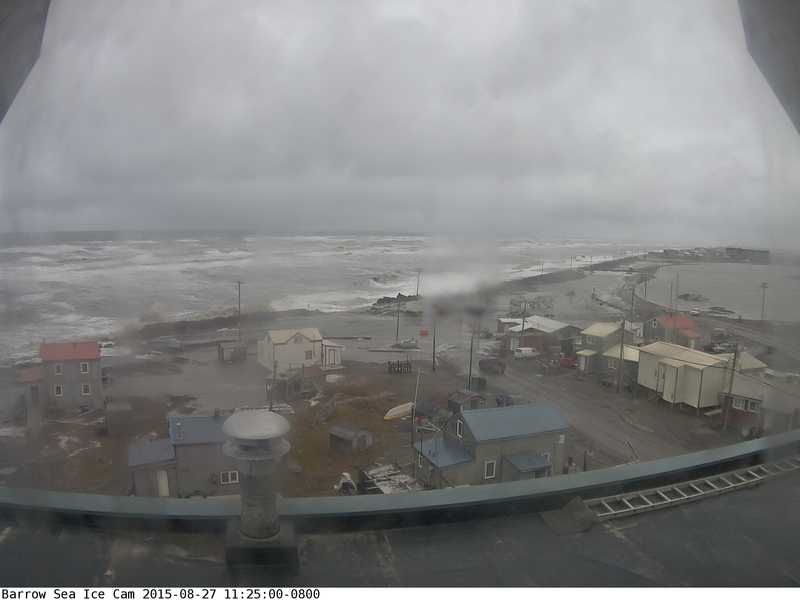 37 mph sustained winds at Barrow station now. That’s basically tropical storm force. Looks like the “sea wall” they built to protect the town isn’t fairing too well. They probably didn’t experience these conditions too often when the wall was built. There is not much solid ground on that coastline to erect any real defense. Traditionally the “solid” can from permafrost and ice, along with a minuscule amount of surface melt in the summer. This provided the equivalent of “rock”. With the deep melt into the soil, it turns from a solid to a soil or even a non Newtonian liquid. There is nothing to anchor a defense onto. And there is scant material which qualifies as a defense locally (sand won’t do it, sorry). Time to think about moving Barrow inland. I was wondering if Barrow might actually be sinking too, for the same reasons you mention here. Certainly possible. The permafrost melt certainly can tend to result in subsidence. We are well inland on the YKD delta and even still we had 36 hours of high gusty winds as the low went by us. Where is the $$$ supposed to come from to pay for moving Barrow and all the other towns and native villages on the coast? Not going to happen imho. To far away from the centers of power. If / when that hits the broken up conglomeration of floating ice crap which seems to qualify as “Ice Extent”, we may see further degradation. Time to watch this locale for a few days, around N81, W141. JAXA shows extent plummeted to 3rd lowest on record today. Concentration under the central basin high has bumped Area up a bit to 6th lowest on record for the date. Some air temps in the range of -2 to -5 C would retard melt in a few regions. But many more regions are still above the -2 C threshold. GFS and ECMWF model runs show storms running in from the Beaufort, the Barents and the Laptev. Central Arctic cyclone may develop by early September. Atsani remnants keep slugging slowly toward the Bering. And we have three tropical cyclones running around the southern edge of the RRR. It’s going to be an interesting September. I’m imagining big slabs of ice surfing in on these waves and smashing through structures once safely inland. It doesn’t seem to have happened this time, but surely this is a possibility? Possible. But right now it looks like there’s no ice left in this region. I suppose it’s possible the storm could tap into some of the off-shore remnant. Let’s hope not. Yes, that could be bad, since some of those chunks are likely to be huge–some of the last remnants of the very old, very thick sea ice that used to exist all along the Canadian Archipelago. Of course, it would take quite a wave indeed to bring a big ice burg very far inland. They tend to pile up on shore into berms. If the waves are energetic enough to push the berms into structures, that would be a rather bad impact. Though it’s rough at Barrow, and we see some flooding, it doesn’t yet look like we have that kind of energetic wave action directly striking structures. Very timely warning reported from the Woods Hole Research Center today, on a known Abrupt Climate Change Tipping Point. . . . . This is good to see, considering how stigmatized the whole issue has become. who started applying the term “Alarmist” to known possibilities ? I wonder – Mr Watts , Ms Curry or Monckton ? Well said David Balton, deputy assistant secretary for oceans and fisheries at the US State Department, I couldn’t agree more . . . . This has to sink in to people and governments everywhere – we must change, we must get our carbon balance right again.. if we value our creation/evolution . .
At last more and more institutions are realizing that the predicted changes are really happening now … lets hope it spurs governments and business into action . .
“This is where we expect to see more extreme weather such as floods and droughts in the future, and what we are gradually starting to see in the present,” said Frank Raes, the head of the climate change unit at the EU’s Joint Research Centre which commissioned the report. Meaningful change come from the people, then when the way forward is clear the governments will safely lead from behind. Another couple of decades, or so, and they’ll be surfing in Barrow! I wouldn’t want to be out there today. Looks cold and gnarly. Robert, a serious development at Barrow. Will send link to KBOO but think subject and your voice makes for good breaking news on radio. I will suggest an interview is in order — PDX/Shell/icebreaker protest, etc. If you connect with a phone number I will forward. All is best ASAP to edit audio by 4 pm for 5 pm Newscast. If it happens, likely News Director will call to record chat. Am sending RS link to KBOO first. Ps Interview just for Barrow and Arctic — not Shell etc, this stuff is the PDX connection. What’s your facebook, DT? I’ll send you my phone # by message there. I will forward number to KBOO News Director. It’s a good one to have on hand for future contact. Ooof. Lots of material up there. I like Excalibur like sword cloud shape and the glareball sun in the sky. That was the sky that day. 1600 HRS PDX Number forwarded to KBOO THX. THX, DT. Will keep a close eye on the phone. Only days before President Obama travels to the Alaskan Arctic on Monday to focus attention on climate change, one of the effects of global warming is again apparent: Hordes of walruses are scrambling onto the Alaskan shoreline, because the Chukchi Sea ice floes where they would normally have rested have melted. The U.S. Fish and Wildlife Service confirmed to the Post Wednesday evening that a mass of walruses had “hauled out,” or gathered on shore, near the remote community of Point Lay. – Interior of article mentions PDX photog w/ up to date photos. Looks like great link too. 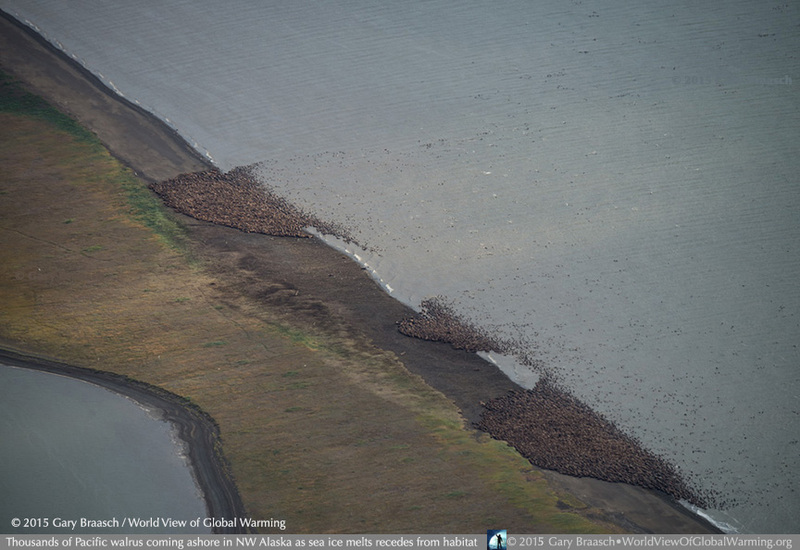 Thousands of Pacific walrus begin coming ashore on an Alaska Arctic Ocean beach, as their preferred ice floe habitat melts away, in one of the earliest haul outs known. Gary Braasch at World View of Global Warming. Has he commented here in the past? He and his work seems like a kindred. Thanks for sharing these links and the bad, sad, but not unexpected news. It really saddens me deep in my gut to see that, confusion and suffering among a fellow species. We have unleashed a monster and it’s target is life as we know it… Hope to hear you again on Radio Ecoshock… Alex feels it’s time. – Wave fetch is dictated by wind, depth and distance until shallow water is encountered when the wave breaks. The lower part of the wave abruptly stops while the top half keeps moving forward. Long distance over deep water makes for big waves. – These are basically fetch driven waves stopped by a shallow reef on a north facing shore. Thank you for the hat tip Robert. I am humbled to have contributed to this great blog in some way. I hope that by you telling their story from afar, the plight of those who are truly on the front line of a massively changing climate is relayed to many. You do great work Robert. Thank you for what you do. You rock, a Griff. And I agree. Will do a cheeta flip if I see someone surfing out there. – Refugees — Body Counts — Terrible. Ugly. Man, DT that’s a rough story. Stark realization of what is the start of a mass movement of people worldwide. All athletics: Football, Soccer, cross country, etc. (golf??) have been moved indoors in eastern Washington and Idaho due to smoke. Spokane had worse air pollution than Beijing’s worst a couple days ago. Fortunately remnants of weather from Hawaii (Danny?) are moving into the state tonight. There is concern that this could bring lightning to the east slope (dry side) of the Cascades and to the eastern half of the state. In western Washington approximately 3% of plants – trees, shrubs, and herbs – are dying. A single spark could turn them into torches. I hope this region gets a break from this drought next year but it’s looking unlikely. 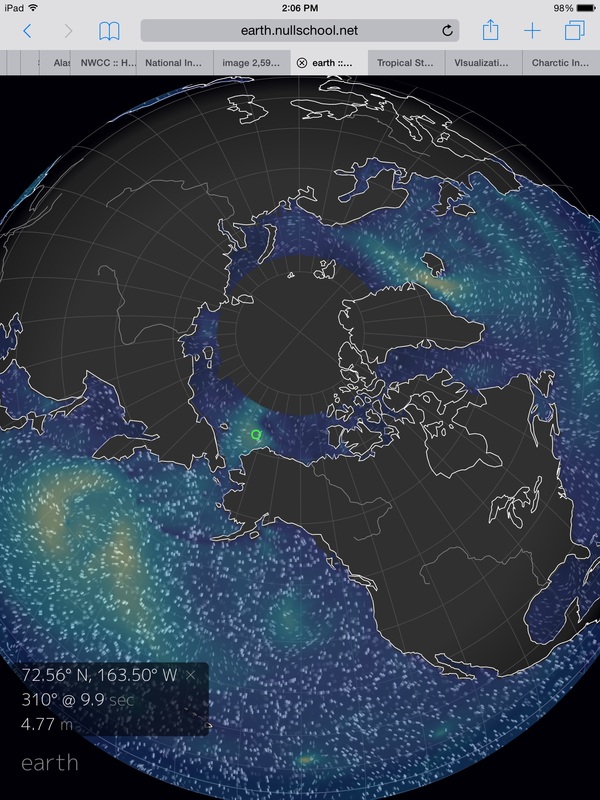 It seems as though the jet stream’s crazy pattern is the new normal. Our governor understands this and talks about it, including today’s visit to the Okanogan complex. Unfortunately our state Senate is controlled by Republicans, mostly from the areas suffering from the fires. From what little I jnow of the northern coast of Alaska, I wonder whether much of the shoreline is silt, dunes, or windblown loess. If no longer consolidated by ice and facing long fetch breakers, I would expect very rapid erosion. Perhaps Mike Huckabee could build a $5 million house there and the taxpayers could insure it. After all, nothing bad could happen to it.